Hi my name is David Knapp, I’m the owner operator of a Dog Guard dealership, Wisconsin Fence and Pet Supplies LLC. We service 11 counties from EastCentral to Northeast Wisconsin. 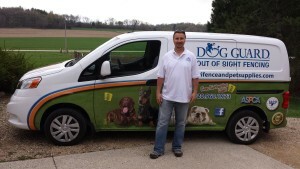 In the years prior to becoming a Dog Guard dealer, I have trained dogs for over 35 years. I raised my first bird-dog when i was 14 years old and have not stopped loving to spend my time training dogs. I have run my dogs in dozens of field trials and sporting events over the years. I thoroughly enjoy training dogs and love to watch them work and do what comes natural to them. I currently breed and run German Short-hair Pointers; but most of all I just have a fondness for cold wet noses. My wife also owns two beloved Clumber Spaniels. I have been a full-time Sheriff’s Deputy for 25+ years and enjoy meeting and working with new people. This job has allowed me to enjoy my love of dogs and the outdoors. I will be retiring at the end of 2016 and look forward to concentrating on dogs. I work with dog safety and supplies on a full-time basis as well as keeping pets happy and safe with a Dog Guard pet containment system. Pets need to be active and that is one of the many reasons I decided to become a Dog Guard Dealer. I look forward to assisting you with your pets’ needs.